If you would love a vacation to a European seaside village but don’t want to lay out the high costs associated with international travel, then St. Augustine, Florida is the perfect destination and the Inn On Charlotte is the perfect accommodation. Rodney Holeman who owns the gorgeous Inn On Charlotte and cooks delicious gourmet breakfasts for his guests, beams with joy when he speaks about the Inn. He has an easy manner and outgoing personality that somehow meld perfectly with his perfectionist design ethic. “When we decided to purchase the Inn On Charlotte, I decided that I was going to do it perfectly or I was not going to do it,” Rodney said. Rodney has worked to lovingly restore the home to reflect its original grandeur and has decorated it with antique furnishings and accessories. Many of these are from his private collection. When necessary, he has used classic reproductions. “Our bed and breakfast features eight superbly appointed guest rooms, each with a comfortable king or queen-size bed, private bath, and cable TV. Seven of our eight rooms have whirlpool tubs, and the eighth room has a large double shower. 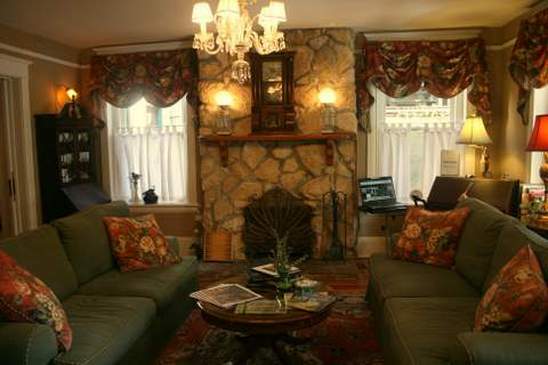 Your experience here at the Inn on Charlotte differs from that of most other bed and breakfasts in St. Augustine. Our home becomes yours to enjoy,” their website states. Each of the guest rooms are named for local historic characters and there is a plaque in each room telling their story. Henry Flagler's Verandah room offers a large balcony which overlooks historic Charlotte Street, a two-person Jacuzzi tub, complimentary wine, a King-size bed, and cable TV. Henry Flagler was a major contributor to the style, art movement, history, architecture, and tourism industry in St. Augustine. Tiffany's Studio is named for Louis Comfort Tiffany who was commissioned in the 1880’s to design the stained glass windows in the palatial grand dinning room of the Ponce de Leon Hotel. Diamond Lil's Suite is named for Louella Day McConnell – the turn-of-the-century’s female version of P.T. Barnham! With her diamond embedded front tooth, she took the myth about Ponce de Leon’s search for the Fountain of Youth, purchased land with a sulphur spring and turned it into a St. Augustine tourist attraction that still attracts tourists today! The Inn On Charlotte is located right in the heart of the Old Towne section of this nearly 500 year old city and within walking distance of The Castillo de San Marcos historic fort, the Bridge of Lions, the oldest schoolhouse in the country, romantic horse-drawn carriage tours, evening haunted ghost tours, and the quaint shops of St. George Street. Leigh Cort, Public Relations Director for St. Augustine’s Inns Of Elegance, loves to share how Europeans who come to St. Augustine’s Old Towne district remark how it reminds them of home. It has a distinctly Old World feel. Guests at the Inn On Charlotte are not only treated to a historic setting and luxury accommodations, they receive a delicious breakfast made from Rodney’s “breakfast bible” – his own hand-written recipe book. During our three-day stay, Rodney treated customers to 1) Chilled cream of Strawberry Soup followed by Eggs Benedict Casserole, melon skewer and blueberry, banana, and sour cream bread. 2) Poached Pear with chilled Almond Cream Sauce followed by Orange-pecan French Toast with powered sugar, pecans, homemade cinnamon syrup and savory sausage links. 3) Fruit Cup with Honey Dew melon, fresh blueberries from a local farm topped with Vanilla Yogurt and mint leaves followed by the Inn On Charlotte Frittata, Brown Sugar bacon, and apricot, banana, and sour cream bread. Watch a video of the Inns of Elegance including the Inn On Charlotte below.